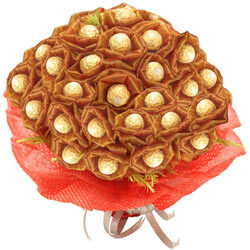 This all-purpose selection excellent gift of Bouquet of 24 Pcs. Ferrero Roacher Chocolates creating a stunning display of beauty with savor, will bring vibrant happiness to the doorsteps of any recipient on his/her special day. (Note The design of this Chocolate Bouquet may vary). We deliver this product across India. Same Day Delivery available only for Ahmadabad, Bangalore, Chennai, Coimbatore, Delhi, Ghaziabad, Gurgaon, Howrah, Hyderabad, Jaipur, Kolkata, Mumbai, Nagpur, Navi Mumbai, Noida, Pune, Thane, Trivandrum. For other locations, it will be sent by courier.